The appetite to live stream to multiple platforms continues to grow with clients looking to tap into as many social media channels as possible. Instagram is no exception. Since the launch of Instagram Live, we have been approached by a large number of our clients who want to know what the best options are to deliver a robust live stream without greatly compromising on quality. To date Instagram live can only go live from a mobile phone. So why approach a live streaming specialist if anyone who has a mobile phone can go live? It’s a valid point but as with all live streams, we look at ways we can use our expertise to make streams more robust, reliable and maximize the output quality. 2. Ensure the audio was of broadcast quality. Our R&D team was charged with the task to build a rig which would enhance the iPhone capturing capabilities. Firstly they addressed the sound, by adding an audio mixer which converted XLR to 3.5mm jack; it meant we could then introduce our digital mixing desk which subsequently meant each of the speakers could wear lapel mics. We also provided a PA system into the room which would have a live audience. Next was the internet connectivity. As a rule GG will not stream if Wi-Fi is the only connection available so the R&D team built a solution that allowed us to take an ethernet connection into the mobile phone which would provide us with a solid, uncontested internet connection. Next was vision – while we are at the mercy of the phone camera capabilities, we looked at various lenses which can be added to give the best quality when capturing five people speaking. The lens we chose allowed us to capture a much wider shot than the native camera would have allowed. 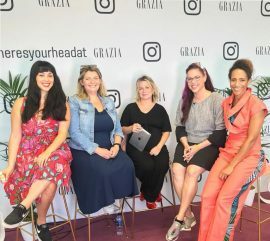 The Grazia event was in support of the ‘Where’s your head at’ campaign for mental health. The panel discussed how to recognize imposter syndrome and what can be done to support women through encouragement and building confidence around their successes. The event was a huge success and left a real appetite to look at further activations on Instagram Live.